How To Build Muscle? Diet, training & rest that’s the recipe. How to Build muscle is not a problem for many who wish to do so. However, how to build muscle fast can be a big problem. This infographic illustrates how to approach this by following 3 common rules. Diet, training and rest. Follow these 3 simple steps and success should should come your way. HIIT ~ High Intensity Interval Training Coming Your Way, So What’s It All About? 5 X Per Week @ 30 minutes per class. COREHIIT – high intensity interval training (HIIT) core blast to challenge & sculpt your abdominal muscles in just 30 minutes. challenge and sculpt every body part in just 30 minutes. High Intensity Interval Training involves alternating between very intense bouts of exercise and low intensity exercise. For example, sprinting for 30 seconds, then walking for 60 seconds is high intensity interval training. HIIT can be used both anaerobically (in the gym with weights) and aerobically with cardio. Exercise physiologists used to believe that “steady state” cardio was superior for fat loss because relatively more fat is used by the body as fuel at lower exercise intensities than at higher intensities. The “Fat Burning Zone” shown on most cardio equipment as only 60%-65% of max heart rate is really a myth and is NOT optimal for burning fat. Yes, you burn more fat relative to glycogen when going for a walk, but what we care about is total fat burn. At higher intensities, you are burning far more fat, even though the fat/glycogen ratio is lower.1 2 In addition, interval training allows you to exercise at very high intensities for a much longer period of time than steady state, so you burn more fat. As an added bonus, there’s also an afterburn effect known as EPOC (excess-post exercise oxygen consumption). You increase your metabolism and burn more calories for up to 24 hours after interval training, whereas going for a jog burns almost NO calories after. If you are a beginner, I would recommend only trying HIIT if you can do a session of cardio for 20-30 minutes at 70-85% of your max heart rate. You can still try interval training, but at a lower exercise intensity and beginners should always wear a heart rate monitor. NOTE: Interval training should begin with a 3-5 minute warm up and end with a 3-5 minute cool down to prevent dizziness, or nausea. I do this HIIT workout all the time on a treadmill, elliptical, or outside. The duration of “work” is 60 seconds, and my “rest” is 120 seconds. The work/rest ratio in this case is 60/120, or 1 to 2. I shoot for 5-10 cycles, depending on the type of cardio I’m doing and if it’s right after strength training. The better shape you are in, the higher intensity you can handle and the higher the work/rest ratio. For example, well trained athletes can use a 2 to 1 work /rest ratio, so they are sprinting for 120 seconds and only resting for 60 seconds. That’s tough! Any type of cardio can be used with interval training, but I would caution against running more than a few times per week, because the demands on your metabolic system and joints are significant. For beginners, I recommend the elliptical, which is lower impact. Swimming, jumping rope, cycling etc. can all work well as training modalities. I rarely go for just a jog unless I just want to clear my head, or get a little sweat. Jogging is child’s play compared to HIIT, which is substantially more effective to help you burn fat in less time and take your body to a MUCH higher fitness level. Cut broccoli into large florets. If you’ve washed the broccoli, make sure it is dried well. 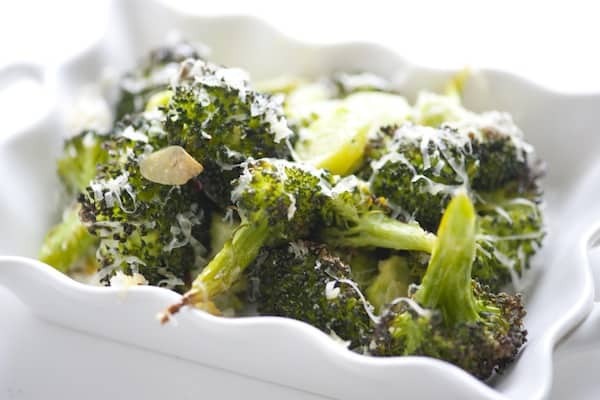 Place the broccoli on a baking tray and toss with 5 Tbsp olive oil, salt and pepper. Add the garlic and toss. Bake for 20 to 25 minutes, until crisp-tender and starting to brown slightly. Sprinkle with lemon zest and juice. Add remaining oil, pine nuts and parmesan, toss and serve with steamed veggies and meat of choice. Vitamin C has taken a backseat in recent years with the advent of many newer antioxidants, but that doesn’t make it any less important. Vitamin C is clearly the ‘grandfather’ of the traditional antioxidants we know of, and its potent health benefits have been clearly established. It’s a powerful antioxidant, which helps neutralize cell-damaging free radicals when taken orally. When used intravenously, the vitamin appears to also directly attack pathogens and has shown promise for treating a wide range of infectious diseases, burns and boosting your immune system. Most recently, a meta-analysis1 from Finland suggests vitamin C may also reduce bronchoconstriction caused by exercise, also known as exercise-induced asthma, by nearly 50 percent. “Previously, vitamin C was found to halve the incidence of common cold episodes in people enduring heavy short-term physical stress, which indicated that vitamin C might also have other effects on people under heavy physical exertion. Vitamin C typically needs to be obtained from external sources. However, a high percentage of it may never reach your cells. As far as getting your vitamin C from food, remember that the more colorful your diet, the higher it will be in bioflavonoids and carotenoids. Eating a colorful diet (i.e. plenty of vegetables) not only helps increase your vitamin C levels but also ensures you’re naturally getting beneficial phytonutrient synergism needed for maintaining optimal health. One of the easiest ways to ensure you’re getting enough vegetables in your diet is by juicing them. For more information, please see my juicing page. You can also squeeze some fresh lemon or lime juice into some water for a vitamin C-rich beverage. The perennial plant Rhodiola Rosea has also been found to have exercise benefits. It’s known as an “adaptogen,” which can help your body adapt to physical, chemical, and environmental stress, and is used by many athletes for improving athletic performance3 and shortening recovery time between workouts. “Professional athletes effectively use Rhodiola rosea (‘golden radix’) extract as a safe nonsteroid food additive improving endurance and rapid recovery of muscles during several decades. Other studies have similarly found that Rhodiola can significantly increase time to exhaustion during exercise5, reduce C reactive protein levels, and improve neuromotoric fitness. For example, a 2003 animal study6 found that rats given 50 mg/kg of Rhodiola rosea extract along with the same amount of Rhodiola crenulata root, prolonged the duration of exhaustive swimming the rats were capable of by nearly 25 percent. This improvement was found to be due to the extracts’ ability to activate the synthesis or resynthesis of ATP in mitochondria. The extracts also stimulated reparative energy processes that take place post-exercise. Rhodiola rosea was determined to be the most effective of the two extracts for improving physical working capacity. Since we’re on the topic of exercise, recovery, and nutrition, let me remind you that your post-workout meal can influence the overall health effects of exercise, so what you eat after your workout is an important consideration. For example, research has shown that eating fewer carbohydrates after exercise can enhance your insulin sensitivity, compared to simply reducing calorie intake7. Remember, keeping your insulin and leptin levels low by optimizing your insulin and leptin sensitivity is key for maintaining good health. Virtually any non-starchy vegetable (limiting carrots and beets, which are high in sugar). Sunflower seeds sprouts are one of the best and pack nearly 30X the nutrient density of most vegetables. It’s important to combine a quality protein with a veggie-type carb in every meal, no matter whether it’s a resistance training day, an interval cardio day, or a non-workout day. However, after strength training (as opposed to cardio training), your body tends to need more rapidly absorbed nutrients and a higher glycemic (fast released, starchy) carbohydrate. Another slight difference between interval cardio and strength training days is the timing of your meal. After cardio, you want to wait 45-60 minutes, and then consume a high-quality protein (whole food) and vegetable-type carbohydrate. (An example would be a spinach salad and some chicken, or high-quality whey protein). After a resistance workout (muscle-building day), the ideal time to consume your post-workout meal is 15-30 minutes after finishing your session, in order to help repair your damaged muscles. A far more common side effect of exercise than exercise-induced asthma is what’s referred to as delayed onset muscle soreness or DOMS, i.e. the muscle soreness you may experience one to two days after exercise. This is caused by inflammation stemming from microscopic tears in your muscle fibers, or more specifically, microtears between your muscles and their surrounding tissues. This most often occurs when you start a new exercise program, change it in some way, or resume exercising after a period of inactivity. Eccentric contractions seem to cause the most soreness, meaning movements that cause your muscle to forcefully contract while lengthening, such as the downward motion of squats or pushups. These damaged muscles release chemical irritants that trigger mild inflammation, which awakens your pain receptors. Other theories about DOMS attribute the phenomenon to changes in osmotic pressure, muscle spasms, or differences in how your muscle cells regulate calcium. 5. Astaxanthin: This naturally-occurring supernutrient is a powerful antioxidant boasting an encyclopedia of health benefits, including decreased post-exertion soreness and faster recovery time. It even increases your body’s ability to metabolize fat! In a 2007 study, mice given astaxanthin showed heightened body fat reduction when given astaxanthin with exercise, compared to exercise alone. 6. Cherries: Cherries are a proven anti-inflammatory, as well as reducing your uric acid level. Cherries have been scientifically shown to help with things like arthritis and gout, and may have some usefulness for general muscle soreness. One study8 involving a group of long distance runners found that tart cherry juice significantly reduced post-exertion pain. 7. Arnica: Homeopathic arnica was demonstrated to reduce muscle soreness among marathon runners in a 2007 study9. 8. Carnosine (which consists of two amino acids, beta-alanine and histidine) is an antioxidant that helps reduce muscle soreness by buffering acids in your muscle tissue, thereby reducing localized inflammation. Carnosine appears to be important for high-intensity anaerobic muscle performance.Most studies find that if you want to increase athletic performance with carnosine, your best bet is to take beta-alanine instead, since beta-alanine appears to be the rate-limiting amino acid in the formation of carnosine. As your muscles accumulate hydrogen ions, their pH falls, making them more acidic. The theory is that by improving your carnosine levels, you can counteract the detrimental effect of these hydrogen ions, thereby enabling you to sustain high-intensity muscle contractions for longer periods of time. As you can see, there are plenty of alternatives available in terms of nutrients that can significantly help improve your performance, reduce recovery time between workouts, and specifically target various side effects of exercise. If you’re one of the 10 percent of people who struggle with exercise-induced asthma, for example, it wouldn’t hurt to try some vitamin C, considering several studies have shown it can reduce bronchoconstriction associated with exercise by nearly 50 percent. If you use a supplement, consider using liposomal vitamin C as it is clearly the best supplemental vitamin C on the market. Setting Fitness Goals That Are Right for YOU! Goals are often confused with other terms that indicate direction or achievements, such as objective, purpose or mission. According to the University of Kentucky, a goal defines success by describing the desired intent or condition. Goals are usually broad and abstract, and may include several objectives, while objectives are specific, time-limited tasks performed to accomplish goals. Everyone has personal goals, whether the goals are clearly developed or barely conscious intentions. Organization goals often change or undergo revisions; however, the organization’s purpose and mission, which define function and reason for existence, seldom changes. Goals encourage people to think about what success looks like. By setting goals, you provide direction, expand your expectations and increase your challenges. Goals provide cohesion for organizations by defining and focusing attention on common desires. For individuals and organizations, setting goals help identify the tasks, procedures, actions and objectives necessary for success. Buffalo State College Leadership Development and Education Center recommends using the SMART formula to set goals. Goals should be specific, measurable and observable, attainable, recorded and time limited. Goals should be realistic and plans for achievement should be tied to a timeline to help you retain focus and evaluate your progression. Include short-term and long-term goals. Often, the achievement of short-term goals helps prepare you to launch your long-term goals. An action plan is an ideal method for visualizing and planning the achievement of goals, according to the University of Kentucky. An action plan includes your goal, which might be to improve your science grades. Include an objective, perhaps to increase the amount of time you spend studying. Add a description of how you will achieve your objective, maybe carving out a science study time from five to seven hours each day. List the resources you need to accomplish your objectives, such as notebooks, textbooks and reference materials. Set a deadline by which you expect to see improvement, such as your next exam. An organization or group can use this same action plan for the achievement of goals by including members as resources and assigning tasks. Speak your personal goal out loud each day. Prioritize multiple goals and focus on one at a time. Make all decisions with your goals in mind — reject decisions that compromise your ability to achieve your goals and make decisions that get you closer to your goals. Goals that require changes in behavior may take time to see evidence of success, according to KidsHealth website. Barriers do not mean failure. Goals often need revision or tweaking. Review your action plan or your written goals regularly. Organizations and groups should have regular meetings to share information and access progress on the achievement of goals. Whether you are looking to lose weight, build muscle, fit back into your wedding dress or just gain some more energy to get you through the day, setting goals is one of the most important steps in getting there. Goals give you something to strive for and can be the best kind of motivator. Be careful of setting unrealistic fitness goals; they can detract from your overall mission and even set you back. The goal of becoming a healthier person should trump all others. Weight loss, improved muscle tone and increased muscle mass are all the side effects of improved health. Shooting for good health above all else will help to make sure you eat right, do the right kinds of exercise and practice safely. Make improving your health your No. 1 priority. One of the best ways to get discouraged is to set a ridiculous goal and then fail at reaching it. Accomplishing goals is the best type of motivation, so increase your chances of success by setting small, attainable goals. If you want to lose 100 lbs., break that up into 10-lb. increments. Every time you lose 10 lbs. you will feel refreshed, renewed and motivated, making the next 10 even easier to lose. Journaling is an effective way of documenting your progress along your fitness journey. Write down everything you think, feel and do with regard to meeting your goals. Then, when you reach your goals you can look back on what it took to get you there. Journaling can also increase your accountability; if you have to write it down, you are less likely to stray. There is a lot less fun in eating a cheeseburger and cheating on your diet if you have to write it down later. Set yourself up for success by sharing your goals with others. Accept feedback, both positive and negative, and use it to make improvements. Whether you are vocal about your fitness goals or spend time with one person you share your goals with, setting goals and vocalizing them can help make you more likely to be successful. It can also help make sure that your goals are more realistic; it is more difficult to share outlandish dreams and goals with a person than it is to share grounded, realistic ones. Fitness programs abound, from yoga and Pilates to aerobics and strength training. So which type of fitness program is right for you? Ask yourself these questions to figure it out. If you are age 50 or older, haven’t exercised for some time, or have chronic medical conditions, such as diabetes or heart disease, it’s a good idea to to consult your doctor before beginning an exercise program. It’s also good to keep in mind that as you age, impaired balance, decreased elasticity of tendons and other factors can limit your exercise capacity. Injuries also are more frequent, and recovery takes longer. But that doesn’t mean you shouldn’t exercise or that you won’t benefit from it. Just be sure to seek input from your doctor or an exercise therapist about how to create a program that’s appropriate for you. Keeping your fitness level in mind, think about why you want to start a fitness program. Perhaps your doctor has suggested that you start a fitness program to lose weight. If you’re already active, perhaps you want to rev up your fitness program to prepare for a 5K race or get ready for a favorite sport. Having clear goals can help you stay motivated. Next, think about the types of physical activities you enjoy most. After all, a fitness program doesn’t need to be drudgery. You’re more likely to keep up with a fitness program you enjoy. If you love riding your bicycle, consider a cycling class. If you have a blast on the dance floor, an aerobics class that includes dance moves would be a good bet. If you’re a social person, a gym or health club membership may be the ticket. If you prefer to exercise alone or you find health clubs intimidating, exercises you can do at home may be best. Aerobic activities should be the biggest chunk of your workout, but you also want to include muscle-strengthening activities such as working with weights or resistance bands. Cross-training, which is doing a variety of different exercises or activities, is a good way to keep exercise boredom at bay. Cross-training also reduces the risk of injuring or overusing one specific muscle or joint. You can base a fitness program around brisk daily walks and inexpensive hand-held weights or resistance bands. Many recreation departments offer discounted fitness classes to local residents, and many schools open their pools to the public for inexpensive lap swimming. You might also consider buying used exercise equipment — or sharing the cost with a friend. You’ve thought through your likes and dislikes and the pros and cons of various types of fitness programs. Now it’s time to get physical. Start slowly and build up intensity gradually. Remember, each workout puts you one step closer to reaching your fitness goals. If you get bored or lose interest in your fitness program, don’t be afraid to try something new. Reassess your fitness level and set new fitness goals. The result? A future of improved fitness and better health. Combine the flaxseeds, salt and paprika on a plate. In a wide, shallow bowl, whisk the egg and soy sauce. Place the pecans on a plate. Dip each steak into the flaxseed mixture, then the egg mixture, and then into the pecans to coat. Heat a large skillet or frypan over moderate heat and add the oil. Cook the steaks for 4 minutes, turn and cook a further 4 minutes. In one recent experiment, lefties who watched an eight-minute clip from the film Silence of the Lambs exhibited more symptoms of post-traumatic stress disorder than did their right-handed counterparts. That may be because the right side of the brain, which is dominant in lefties, is more involved in the fear response, according to Dr. Carolyn Choudhary of Queen Margaret University in Edinburgh, as quoted in The Telegraph. But more research is needed, Choudhary warns. Left-handed and ambidextrous people are more susceptible to negative emotions, including anger. A small study published last year in the Journal of Nervous and Mental Disease found that the brains of lefties process emotions differently than those of righties, with more communication between the brain’s two halves. As a result, the areas that produce negative emotions experience greater activity, according to the Daily Mail. Then again, maybe lefties are just “more angry because the world is designed for the right-handed majority,” says John Cloud in TIME. That emotional wiring also may explain why righties tend to charge ahead, while lefties “tend to dither,” according to behavioral psychologist Lynn Wright, as quoted in NewScientist. A study performed by Wright at Abertay University in Scotland found that lefties were more restrained and more worried about making mistakes. Many sources claim that left-handers may die as many as nine years earlier than right-handers. The word left in English comes from the Anglo-Saxon word lyft, which means weak or broken. The Oxford English Dictionary defines left-handed as meaning crippled, defective, awkward, clumsy, inapt, characterized by underhanded dealings, ambiguous, doubtful, questionable, ill-omened, inauspicious, and illegitimate. Research has shown a link between trauma during gestation or during birth with an increased chance of being left-handed. Tests conducted by St. Lawrence University in New York found that there were more left-handed people with IQs over 140 than right-handed people. Famous left-handed intellectuals include Albert Einstein, Isaac Newton, Charles Darwin, and Benjamin Franklin. The German for “left-handed’ is linkisch, which means awkward, clumsy, and maladroit. In Italian, the word is mancino, which is derived from “crooked” or “maimed” (mancus) and is also used to mean deceitful or dishonest. In Russian, to be called a left-hander (levja) is a term of insult. In the Talmud, the Chief of Satans or Prince of Demons is named Samael, which is associated with the Hebrew word for left side, se’mol. The angel Michael sits on God’s right-hand side, while Samael is on his left-hand side. This attribution of evil to the left and good to the right appears in various forms throughout the world. Among the Eskimos, every left-handed person is viewed as a potential sorcerer. In Morocco, left-handers are considered to be a s’ga, a word that means either a devil or a cursed person. The Incas thought left-handers were capable of healing and that they possessed magical abilities. The North American Zuni tribe believed left-handedness signified good luck. Herbert Hoover is believed to be the first left-handed president, though James Garfield could write Greek with the left hand and Latin with the right. Research indicates that left-handers are more likely to become alcoholics, schizophrenic, delinquent, and dyslexic. They are also more likely to have Crohn’s disease, ulcerative colitis, or mental disabilities. Scholars note that despite these maladies, left-handers have survived because they are traditionally successful in combat. Many artistic representations of the devil show him to be left-handed. The Boston Strangler, Jack the Ripper, and Osama Bin Laden were lefties. In witchcraft texts in medieval Europe, it was the left hand that was used to harm or curse another person. To affect a curse, witches were instructed to silently touch the recipient with the left hand, which would convey the curse. Additionally, the devil supposedly gives the gathering a benediction with the left hand, as opposed to the right-handed blessing of the Christian church. He would also baptize or anoint with his left hand. Medieval Jewish philosopher Maimonides (A.D. 1135-1204) listed 100 blemishes a Jewish priest could not have, and being left-handed was one of them. The right hand is mentioned positively 100 times in the Bible, while the left hand is mentioned only 25 times, all negatively. In many Islamic countries, people are forbidden to eat with their left hand, which is considered “unclean” because it is used for cleaning the body after defecation. Additionally, “public display” or use of the left hand is against the law in some Islamic countries, including Saudi Arabia. Although approximately 90% of all humans are right-handed, cats, rats, and mice that show handedness seem to be equally split between right- and left-pawedness. Human asymmetrical behavior patterns involve the foot, eye, and ear as well as the hand. In each case, humans show the same rightward bias they show toward handedness. Left-handedness has also been called mancinism, sinistromanuality, and cackhandedness. Other colloquialisms for left-handedness include skivvy-handed, scrummy-handed, kaggy-fisted, cawk-fisted, gibble-fisted, southpaw, cunny-and ballock-handed. According to tradition, an itchy left hand indicates you will lose money. An itchy right hand indicates you will receive money. Some scholars postulate that increased levels of testosterone in the womb increase the chances of becoming left-handed. This may explain the correlation that seems to exist between left-handedness and some immune disorders, as testosterone has been linked to immune disorders. Studies have suggested that left-handers are more talented in spatial awareness, math, and architecture. Right-handers tend to be more talented verbally. The gene LRRTM1 is a strong contributing factor for left-handedness. Scientists discovered the gene during a study of dyslexic children and believe it is inherited from the father. Left-handedness runs in families. Lefties in the British royal family include the Queen Mother, Queen Elizabeth II, Prince Charles, and Prince William. Many people who are left-handed draw figures that face to the right. Left-handers are more likely to be dyslexic and to stutter. One in four Apollo astronauts were left-handers. Connections between the right and left sides of the brain are faster in left-handed people. This means information is transferred faster, making left-handers more efficient in dealing with multiple stimuli and using both sides of the brain more easily. Ultrasounds show that in the womb, 90% of babies appear to favor the right thumb, which corresponds to population breakdowns of right-handers and left-handers. Researchers postulate that the proportion of left-handers has remained constant for over 30,000 years. Studies suggest premature babies are more likely to be left-handed. Additionally, infants with low Apgar scores at birth are more likely to be left-handed than children who have higher Apgar scores. Juniata College in Huntington, Pennsylvania awards up to $1,500 in academic scholarships to students who have top academic records and who are left-handed. Researchers note that on average, left-handers reach sexual maturity later than right-handers. There are two divergent theories regarding wearing the wedding ring on the left hand. One theory is that it started with the ancient Egyptians, who believed that despite the left hand’s supposed flaws, placing the ring on this hand brought it nearer to the heart. Another theory attributes the origin to the Greeks and Romans, who wore the rings to ward off evil associated with the left hand. About 30 million people in the United States are left-handed. When placed on their tummies, right-handed babies tend to turn their heads to the right. Left-handed babies usually turn their heads to the left or they don’t show any preference. Less than 1% of the world’s population can be considered truly ambidextrous. Research suggests that left-handers are slightly more prone to allergies and asthma than right-handers are. Studies have shown that if a left-hander injures his dominant hand, he has an easier time learning to use the other hand than his right-handed counterparts. In a recent experiment, left-handers who watched an eight-minute clip from the film Silence of the Lambs showed more fear than right-handers. Scientists believe that this may be because the right side of the brain is dominant in lefties and is more involved in fear responses. According to the Journal of Nervous and Mental Disease, the brains of left-handers process emotions differently than those of right-handers and are more susceptible to negative emotions, such as anger. The longest words that can be typed using only the left hand with conventional hand placement are sweaterdresses and tesseradecades. Studies suggest that lefties are more restrained decision makers than their right-handed counterparts. 7 Food Ingredients to Avoid … you’ll feel better for it! The fact that white flour is bad for your health isn’t necessarily groundbreaking nutrition information. However, this powdery white substance also sneaks its way into foods like soups and salad dressing by acting as a thickening agent. Because of its empty calories and high blood glucose content, even a small amount can cause mood swings and hunger pains. Rule of thumb: If it’s white, don’t take a single bite. Instead, choose 100% whole grains or gluten-free options. This food dye is one of the most commonly used dyes. Its sole purpose is to make food colorful and enhance the flavor, and it’s hidden in everything from frosting and chips to sports drinks and fruit snacks. However, don’t let the bright color or tastes fool you: this additive is linked to hypersensitivity and ADHD among children and adults. Rule of thumb: Don’t be misled, stay away from RED. Ensure even your favorite organic snacks are free and clear of this harmful dye. Hydrogenated oils are processed oils that are used by manufacturers to extend the shelf life of products. Hydrogenated oils are also responsible for creating trans fat in foods. Trans fat is shown to increase cholesterol levels and increase weight since your body has to work extra hard to digest it. It can also cause brain fog and severe moodiness. Rule of thumb: The shorter the expiration date, the better for your weight. (And your happiness!) Opt for products that expire within a week or two. And always choose healthy oils like organic coconut oil or organic extra virgin olive oil. Aspartame is an ingredient used to sweeten “sugar-free” products on the market. While you might think you’re doing yourself a favor by skipping the sugar, you might want to think twice. Aspartame is a chemical that has been shown to cause headaches, digestive issues and even seizures. Rule of thumb: If it says sugar free, it most likely means hazardous chemical concoction. Instead, sweeten foods with 100% raw cane sugar, coconut sugar or raw honey. Our bodies aren’t meant to process chemicals, and that certainly applies to this one. Yellow no. 5 is a food dye most commonly found in cookies, soft drinks and even gum. If a product contains high quantities of yellow food dye, it can give food or drinks a yellowish glow. This food dye has been linked to asthma, allergic reactions and mood disorders. Rule of thumb: If it contains yellow, say hell NO! Always take caution before eating foods or candies that are extremely colorful, as they’re more likely to contain food dyes. Monosodium glutamate, also known as MSG, is commonly used in packaged foods to enhance flavor and extend shelf life. Many products like chips, soups and frozen meals contain MSG. Consuming even small amounts of this ingredient can lead to light-headedness, nausea, feelings of anxiety and weakness. Sugar is hidden in almost every processed and packaged food, including chips, sauces, fruit juices, cereals and energy bars. Sugar is often disguised by one of its many names: dextrose, fructose, corn syrup, lactose and sucrose. Eating foods that are high in sugar can contribute to health issues such as diabetes, thyroid issues, depression and weight gain. Rule of thumb: When sugar is a main ingredient, opt for a sweet fruit as a supplement. If you really have a fix for something sweet, opt for a healthier version of your favorite treat. Preheat the oven to 180°C. Line a baking tray with baking paper. Melt butter in a skillet over low heat and add onion. Remove the silver beet leaves from the stalks. Dice the stalks and add to the onion mixture, and cook gently for 10 minutes, stirring occasionally. Add the chopped bacon to the onion mixture and cook for 5 minutes. Chop the silver beet leaves. Add to the pan, along with the garlic and sundried tomatoes. Cook, stirring frequently, for 3 to 4 minutes. Put the ricotta into a mixing bowl. Add the onion mixture and stir to combine. Add the egg and parmesan and mix well. Open each thigh fillet out and place on a chopping board. Cover with a piece of baking paper and hit with a meat mallet or rolling pin to flatten to a thickness of about 1cm. Place a generous Tablespoon of the ricotta mixture onto each thigh fillet and fold over. Carefully transfer to the baking tray using a spatula or egg flipper. Cover with foil and bake for 35 minutes. Remove foil and bake a further 10 minutes to brown the chicken slightly. Note: Any left-over filling can be cooked in muffin pans for around 25 minutes (or until lightly browned) and enjoyed for breakfast or lunch. You are currently browsing the Coffs Coast Health Club blog archives for August, 2013.